300 lb. Olympic Rubber Encased Wide Flange 3 Hole Grip VTX Plate Set This set consists of the..
Urethane Encased Curl Round Barbells, Set of 20-110 lb. Urethane Round Head Curl Bar Set, 20-110 lb. (10 lb. increments) Barbells are also available ..
210 lb. Olympic Set, Gray Plates, 7" Chrome Bar & Spring Collars This set consists of the..
Urethane Logo Curl Round Barbells, Set of 20-110 lb. Urethane T-Clog Logo E-Z Curl Barbell Set, 20-110 lb, (10 lb. increments) Barbells are also a..
300 lb. Olympic Set, Gray Plates, 7" Chrome Bar & Spring Collars This set consists of the.. Colored Bumper Plate Weight Set, 10-45 lb. Our VTX colored solid rubber bumper plates have quickly become the industry standard for quality .. Regular Boxed Weight Set, Gray, 110 lb. 110 lb. Regular "Boxed" Set, Gray Plates, 5" Chrome Bar, (2) 14" Chrome Dumbbell Handles & Sp.. Regular Boxed Threaded Weight Set, Gray, 110 lb. 110 lb. Regular "Boxed" Threaded Weight Set, Gray Plates, 5" Chrome Threaded Bar, (2) 14" Chrome ..
2" Olympic Black Plate Set, 210 lb. 210 lb. Olympic Set, 2" Black Plates, 7" Chrome Bar & Spring Collars. Black finish with raise.. Regular Boxed Threaded Weight Set, Gray, 160 lb. 160 lb. Regular "Boxed" Threaded Weight Set, Gray Plates, 6" Chrome Threaded Bar, (2) 14" Chrome ..
2" Olympic Black Plate Set, 300 lb. 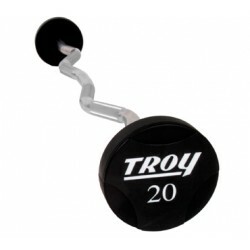 Troy Light Workout Weight Set (W/GR-R Grip Plates) The TROY Workout Strength Training set inc.. Regular Boxed Weight Set, Black, 110 lb. 110 lb. Regular "Boxed" Weight Set, Black Plate, 5" Chrome Bar, (2) 14" Chrome Dumbbell Handles &.. Solid Urethane 12-Sided Barbells, Individual 20-110 lb. Solid Urethane 12 Sided Straight Barbell, individual fixed weights ranging 20 lb to 110 lb. B.. Regular Threaded Weight Set, 160 lb. 160 lb. Regular "Boxed" Threaded Weight Set, Black Plate, 6" Chrome Bar, (2) 14" Chrome Dumbbell ..